In 2014, there was an important change of legislation in Australia regarding superannuation arrangements and self-managed super funds. At the time, I had written several LinkedIn profiles for a superannuation company and noticed a real lack of information about this change. I was interested in what was happening but had to actively find information about it from the financial services industry. My background was HR and I wasn’t seeing much about it come through my social media feed. People don’t like being sold to, they like being invited to something if it’s relevant to them. To leverage the company’s LinkedIn profiles, I proposed to the client that their team invite all their LinkedIn connections to a free education session. This session would educate people about the legislation changes and what it would mean for them. Invitations are a critical aspect of any marketing strategy. In fact, marketing expert and author Michael Port advises in his book, Book Yourself Solid, that a business should always have something to invite people to. This is because although people don’t like being sold to, they like being invited to something if it’s relevant to them. After the staff reached out to their connections on LinkedIn, the superannuation company had 500 new leads. This was from just one event! What the business had done was transform its staff into influencers for the organisation. Research tells us that the average LinkedIn user has 750 connections. Multiply that by 70 staff members and you potentially expose your brand to 52,500 people! In addition, people are eight times more likely to read content that comes from a personal brand than from a business brand. The reason for this is that it feels more “human”. The customer feels as though a person is sharing something of interest with them, rather than a faceless company that only wants to take their money. In other words, a personal brand creates meaning. It builds trust with potential customers, which means they are more likely to want to work with you. By leveraging the people in your organisation as influencers, you tap into an area of marketing that is under-utilised yet highly cost-effective. In my experience, there are generally four types of influencers. They are either internal or external and can be part of a business brand or a personal brand. This is generally someone who works within the organisation. They’re typically a manager or leader and have an area of expertise. The great thing about ambassadors is they have a wealth of experience, which means they’ve built a lot of networks. This is ideal for attracting talent. Ambassadors typically have a history of connecting with people and they can identify where potential future talent could come from. They’re also great for teaching the market. Often, they’re subject matter experts, so make sure you tap into their expertise and knowledge as part of your marketing activities. Rainmakers are people who are paid or receive a financial benefit for being the face of the business brand – for example, a CEO or founder. They are internal to the business but have also built their own strong personal brand. Good examples of rainmakers are Naomi Simson, founding director of RedBalloon, and Bernard Salt when he was working with KPMG. Rainmakers derive income from speaking and books, as well as from people who want to do more work with them personally – which also feeds into the income stream of the business they represent. The benefit of rainmakers is that they leverage social media networks and connections. People want to connect with them. For example, LinkedIn has recognised Naomi Simson as one of the most influential thought leaders in Australia attracting more than 2.2. million followers. It’s extremely difficult for a business brand to get that kind of following, but it’s much easier for a personal brand. Naomi has proven she’s a master of personal branding. She’s been on the TV show Shark Tank and is highly savvy about what it means to build a rainmaker brand. Social stars have large social-media followings and incredible influence over consumers who buy products. They are external to the business yet have influence over business-to-business and business-to-consumer markets. Business-to-consumer social stars typically work in the sphere of consumer products, such as food, drinks, fashion and music. Business-to-business companies are also using social stars for their marketing strategies. These people are often micro influencers in their markets. They are known for an area of expertise that they regularly produce content about. Social stars help businesses by sharing or writing blogs about a product or service. Microsoft is one company that has successfully identified and leveraged influencers for its services. Essentially, advocates are customers. They have first-hand experience of a product or service and are an ideal way of validating a business’s brand. They are a wonderful resource for businesses that want to create a “human” connection with their audience. Testimonials and videos are simple yet effective ways you can tap into and leverage the positive experiences of advocates. Another aspect of this is to create something remarkable that people will talk about. In his book Talk Triggers, marketing expert Jay Baer discusses the four different types of “talk triggers” to get people talking about a product or service. These are: what’s remarkable about it, is it repeatable, is it reasonable, and relevant? So, if you want to create advocates for your business, consider these four talk triggers as you formulate your marketing strategy. 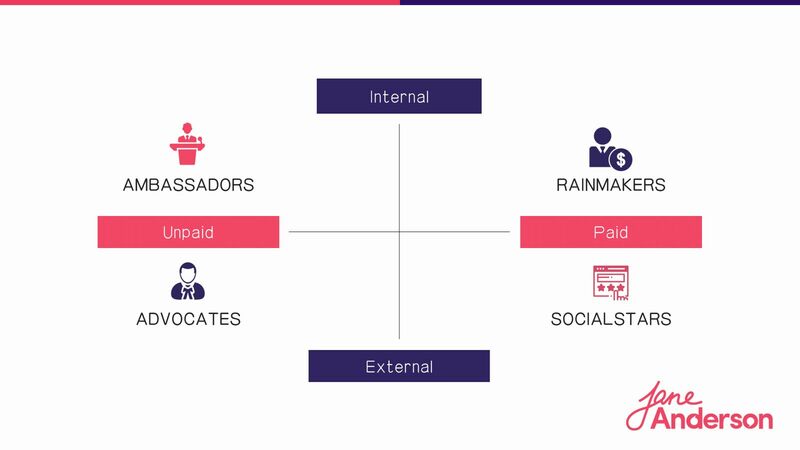 If you can tap into these four influencer types, you will be well on your way to making genuine, meaningful connections with your audience. Whether you use Influencer Marketing as a tactic or strategy is entirely up to you. You can read more on a great case study here on Influencer Marketing with the use of all 4 Influencers.